I normally don’t like reading book series because of cliffhangers but this one is an exception. This is also the book I pledged to read for the National Readathon Day that happened yesterday. The summary was very vague and it quite reminded me of The Maze Runner. Why? Charlie and Silas have been friends since they were young and now they don’t remember anything and anyone around them. (But don’t worry because there is no glade and gladers in the story or something like that.) I don’t really want to say anything about the storyline so you need to buy the book and let yourself dive into it. It’s my first time reading Ms. Hoover’s and Ms. Fisher’s work so I don’t have any idea about their writing styles. Obviously, they have different styles but in this book, I felt like it was written by only one author. The delivering of the story and blending of their styles are impressive. Also, Colleen writes for Silas, and Tarryn for Charlie. I love the romance, suspence, and mystery in this story. I love that the characters have different attitude but they seem so perfect together. I love the story even though I knew that it contains a major cliffhanger. Everyone talks about it and some really didn’t like it. I personally like how it ended which makes me feel weird about it. 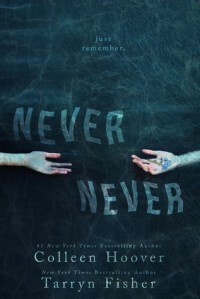 Never Never is a uniquely captivating story that left me wanting for more. And right now, I have to wait until May 17 for the sequel.